Julia finds something nasty written about her best friend on a wall at the Kingston School for the Deaf. As a true best friend, she covers it up with a beautiful graffiti mural. This so-called best friend snitches, and gets her expelled from her school. Julia's two mothers send her to a "mainstream" school in the suburbs, where she's treated like an alien for being the only deaf student. The only thing she has left is her art- and although she promised her mothers she would give up graffiti, Julia finds herself being more and more dependent on her art. Eager to let the world know that she's willing to declare art turf even in the suburbs, Julia paints everywhere. Soon, she realizes that someone is improving her tags, adding their own style to them. Julia has been dragged into a "full-blown graffiti war". Before I begin reviewing this book, let me tell you something. I loved this book so much and found it so easy to read that I finished it in less than two hours aboard a flight! 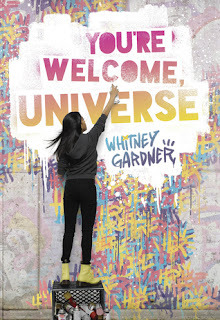 I know that flights are a great place to catch up on reading, but Whitney Gardner's debut novel really was a breeze to get through! The book was the perfect blend of light and profound, expressing serious concerns about our neglect of the Deaf Community in a simple way that reached the readers through the voice of Julia and her various emotions. It really allowed me to understand a little more about a community that I'd rarely ever read about. The novel further incorporated diversity by clearly establishing that Julia's parents were lesbian. However, it wasn't a plot point, and was simply part of Julia's history. This element of the novel really stood out, because it's the first book I've read where LGBT is part of the novel but as a regular part of life instead of being highlighted as the main point of a romance. Gardner also incorporates illustrations of Julia's artwork into the book, making it much easier for the reader to relate to Julia's tangents, frustrations and joys. I'd recommend this book to readers of the YA Contemporary Genre who are looking for something non-romantic to read. This is also something that anyone looking for a book about diverse characters to try out. Love the sound of this book, really interesting. Even though I don't read a lot of YA it certainly is tempting so will note it. This book sounds so interesting. The premise kind of reminds me of the show Switched at Birth, a little. I definitely need to add this to my tbr. I used to watch that show- it was my first introduction to Deaf Culture. you have me a "perfect blend of light and profound" and "breeze" what else can you ask from a book??? so artwork illustrations??? OMG!! The cherry on top! I just added it to GR! I hope you enjoy it- I certainly did! OMG I just realized it also lgtq!!! I AM SO READING THIS NEXT!!! Thanks!